Would you like to feel completely and utterly carefree? You would? Excellent, I have exactly the record for you. A track from 2002 that stood no chance whatsoever of being a hit, except perhaps in Austin Powers’ imagination. The record I speak of is one that was only made possible by Britain’s annoying habit of abandoning pop stars just as they’re getting really good, and Japan’s tendency to welcome them with open arms because something – in this case I suspect politeness and lush orchestral arrangements – made them delightful and irresistible. I’m referring of course to Swing Out Sister, who quite sensibly read the writing on the wall at home and turned their attention towards a country which still had the good sense to adore them. Such was their popularity that they were asked to record a love theme for the popular Japanese soap opera Midday Moon – the result, Now You’re Not Here, was so successful that it even broke into the domestic singles chart, usually the province of home-grown artists. Japanese pop is a fascinating but relatively insular thing, rarely travelling beyond its own geographical borders. But in the early 1990s a musical movement known as Shibuya-kei began to take off – inspired by sixties jazz (think Astrud & João Gilberto), Phil Spector‘s Wall of Sound and Brian Wilson‘s more experimental stuff, its de facto leaders were Pizzicato Five, who broke out internationally and found themselves soundtracking many a British dinner party as part of our own easy listening revival. Swing Out Sister‘s 1989 album Kaleidoscope World is, in many ways, prototype Shibuya-kei – rooted in the sixties but filtered through a modern synth pop sensibility. It’s no wonder they became such huge stars there. Written by Antônio Carlos Jobim, the most famous recording of this song is his own duet version with Elis Regina from 1974. Where that rendition was lovely and gentle, Akiko‘s is like shoving an entire bag of Sherbet Dip Dab in your mouth in one go – it’s positively effervescent. The best way I can explain this record is by telling you what it makes me want to do – jump out of bed, throw open my curtains to discover a dazzlingly sunny morning, run out into the street leading a troupe of day-glo clad dancers with exciting hats on, before taking off in a hot air balloon. You don’t get that with Love Will Tear Us Apart, do you? 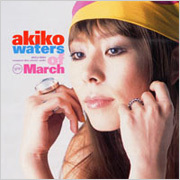 Produced by long-term Swing Out Sister collaborator Paul Staveley O’Duffy, Waters of March sees Akiko and Corinne Drewery surrounded by grin-inducing percussion, flute, saxophone and synths, and the pair trade lines and laughs like they’re having the most fun ever. By the time the heavenly chorus – courtesy of the Opus Dei Singers – joins in at 3:14, I guarantee you will be too. I love this song because it makes me feel completely alive and that anything is possible. So whatever kind of day you’re having, stick Waters of March on and it will get significantly better. Who could sing this today and have a hit? Oh, probably Meghan Trainor. This version just blew me away, but even better…finding your description of how it made you feel. Perfect…bliss. Jump out of bed etc…the dancing in the street. Love this review, thanks for the joy.